SUMMARY: Oil Prices continue their slow downward slide with no end in sight ($US 30 per barrel in 2016 is possible) as supply exceeds demand and oil inventories at record highs (3 million barrels a day in 2Q/15). While airlines are having a very profitable year with average fuel costs down 34%, the offshore helicopter operators are hurting, as exploration is pretty much halted and production slowly being reduced. The top 4 offshore operators (Bristow, CHC, ERA and PHI) are reporting decreasing revenues and falling stock prices as they struggle to cope with new market realities after many years of high growth. 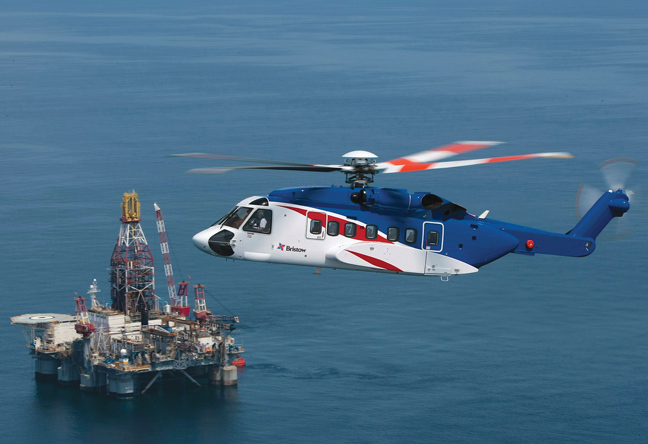 The OEM’s are starting to feel the pain, Sikorsky (sold by UTC to Lockheed Martin), AugustaWestland and Airbus Helicopters will have deteriorating orders and deliveries as the heavy and medium helicopter segment starts to stagnate. CHC Group sees its stock become a penny stock only 20 months after its IPO at $10.00, now NYSE:HELI at $0.40, yes 96% loss in value, as its “creative” accounting creates a loss of $794 million (- 46.5% net profit margin YE 2015), $1.016 billion loss in 4 years (inc. $985 million in Goodwill and Asset Impairement write-downs) ? stock now 4 months away from being de-listed from NYSE ($US 1.00), IPO investors litigating and yet private equity power house Clayton, Dubilier & Rice buys 600 million CHC Group convertible preferred shares at $1.00 (with conversion price of $US 7.50 per share) ? when all other investors are bailing out from HELI shares ? The next 2-3 years will be very difficult for the offshore helicopter market, operators and OEM’s and it won’t be very pretty for some, as a major shakeout is coming. As oil prices continue their slow path below $40 a barrel to a possible $25 to $30 a barrel in 2016, not everyone in aviation is happy about this. The DOW dropped 531 by 531 points on Friday, China’s stock market drops 8.5% today and the TSX down on Friday by 263 on news of falling oil prices (WTI Crude <$41/barrel, Brent Crude <$48 per barrel and the possibility of oil around $30/barrel next year) and on more bad news on China economic slowdown, and its effect on commodity prices, and imports. 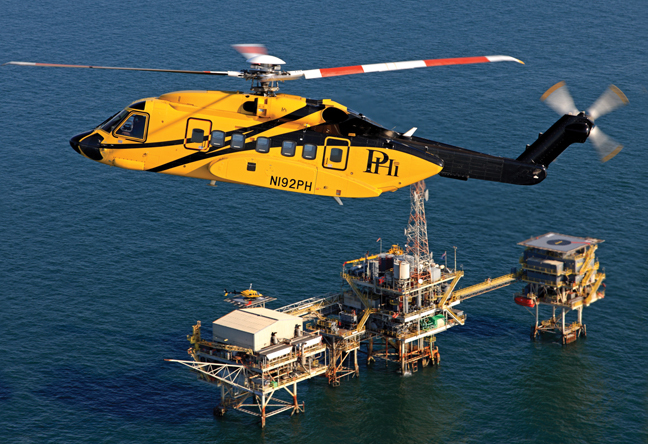 The decline of oil is good news for airlines and general Aviation, but horrible news for the oil and gas support helicopter operators, that fly offshore with large and expensive twin engine helicopters. No secret that low oil prices are helping airlines with a very good financial year, as oil has dropped 60% and airlines are on average paying 34% less for fuel this year, and not giving it back to consumers through lower ticket prices, meanwhile the large offshore helicopter operators are hurting, some struggling for survival as exploration has come to a halt and production slowing down. The operators are doing what they can, layoffs, reduction in helicopters, flying and orders, but will that be enough ? Meanwhile stock prices of the big 4 operators are down from the beginning of this year reflecting the pessimistic view of any recovery till 2018 at BEST (Bristow Group -45%, ERA Group -15%, PHI Inc. -15% and CHC Group -90%), meanwhile airline stocks prices are up around the world. The airlines are having the best year ever, US airlines alone have doubled their 1st half 2015 profits to $8.7 billion over 1st half 2014. The net profit margin for the top 10 US airlines was 11.2% a 128% increase over last year’s 4.9% net profit margin. These are surely good times for most airlines around the world as the main driver of this boom is the fact that airlines are paying an average of 34% less for fuel, their #1 expense that generally consumes 30-35% of its total operating costs. In the first 6 months of this year alone, fuel savings at American Airlines are $US 5+ billion, United $US 4+ billion and $US1.7 billion at Delta Air Lines (incurred big hedging losses early this year) which is driving the US industry to a new high in 2015 in profit margins, which is being used to reduce debt and share buy backs that reward equity owners, but do not expect to see any of those big profits to reduce air fare, the BIG 4 (America, Delta, Southwest and United, all having completed major competitor acquisitions in the past 7 years, and 3/4 having “restructured under Chapter 11 bankruptcy, are holding on tight to their 85% market share oligopoly for now (US Justice Department now investigating possible “capacity discipline” collusion). In Europe the 2nd Quarter was generally better than last year at most airlines, with margins not as high as in the US, but most in positive net profit margins, except those airlines still struggling with restructuring (Air Berlin, Alitalia, Air France-KLM), again lower fuel expenses helped everyone a great deal. OPEC’s refusal to cut back production, as mainly Saudi Arabia wants to put high cost producers (shale, offshore and oil sands) out of business, so that OPEC can once again create dependence on its oil, especially the US which thanks to environmentally destructive fracking, has become pretty much independent in oil and now exports gas. In fact the Saudi’s are hurting in their own way, huge military budget as Saudi Arabia spends $US 80.8 billion (3rd highest in the world) and readies for some kind of war. The government gets 90% of its revenue from oil, and just did a rare $5.3 billion bond issue as it has been cashing in foreign assets at $60 billion in 1st half of this year, 20% budget deficit this year, increasing ISIL terrorism on home soil, air force bombing Shia’s in Yemen will bring more terrorism to the Kingdom and possible conflict with Iran and the Saudi Kingdom is setting the stage for instability within its borders over the next few years, then oil will be very high again. Iran, the nuclear deal is done, even if the US with Israeli lobbying does not agree the other major powers have and will ease sanctions on oil production and trade. Iran could potentially add a further 2.0 million barrels a day to the global oil export market, more supply means lower price again. Fracking, even though the US rig count is at only 46% (747) from its high last October of 1,608 but those that remain are using new technology to get higher ouput, now at 9.5 million barrels a day, yet break-even is $70 a barrel. Russia, hit my sanctions for occupying Crimea and trying the same in eastern Ukraine, plus a falling Ruble (now 71 RUB/$US) and lower oil prices, is hurting economically and is making up the short fall in its budget by pumping more oil, to pay for its militarization and glorifying the very popular new Russia to its home crowds. Demand, economic slow-down in BRIC (Brazil, Russia, India and China), plus renewable energy drives around the world have cut demand, so as long as supply > demand, prices will come down. The good news about low oil prices, is not good news for the oil exploration and production companies and their suppliers, in this case I am talking about the BIG 4 commercial helicopter companies (the #1 operator is Bristow Group (UK), CHC Group, ERA Group, PHI Inc.), all of which are suffering. The decline of oil prices is forcing offshore helicopter operators to cut back, while their stocks are down, and that brings down their market capitalization. 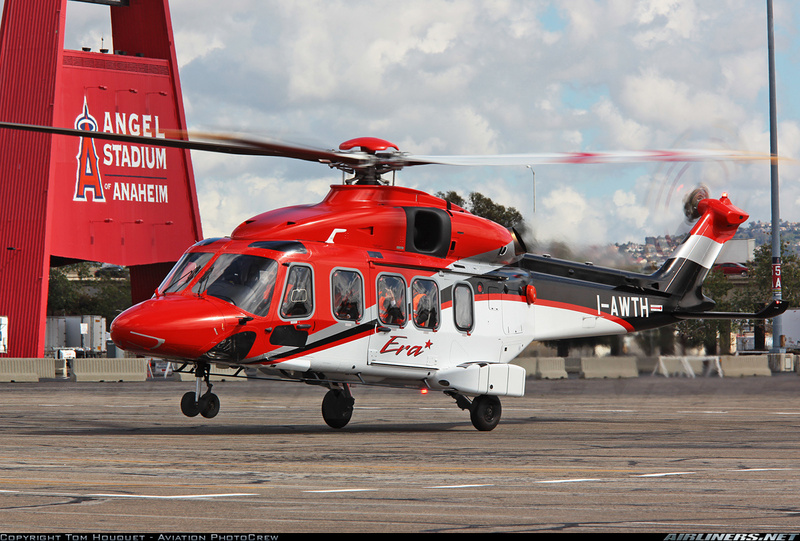 The #1 operator is Bristow Group (UK), with 344 helicopters and 79 fixed wing aircraft (owns Eastern Airways) and whose market cap is now $US 1.3 billion and (ABOVE photo left-Bristow Sikorsky S92A), #2 PHI Inc (USA) with 278 helicopters and fixed wing aircraft has a market cap down to $US 424 million (ABOVE photo center-PHI Sikorsky S-92A), #3 ERA Group (USA) with 160 helicopters and its market cap is down to $374 million (ABOVE photo right-AugustaWestland 139. These operators will have to bunker down for the next 2-3 years and “hope” for better days. But before I get to the operators, I need to touch on the commercial helicopter OEM’s that produce the high end helicopters for the oil and gas industry. 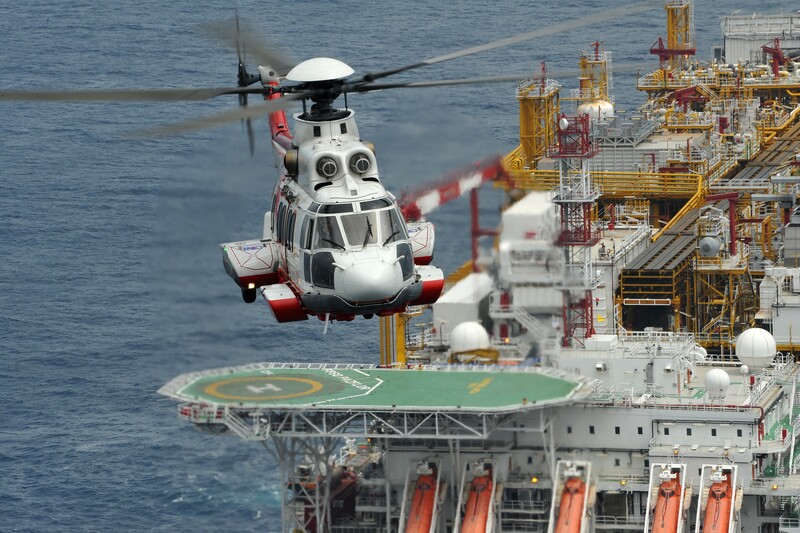 There are 3 new super medium helicopter programs that owe their existence to the offshore oil and gas market, the Airbus Helicopters $US 17.5 million EC175 (2+12/18 seats, 8.3 ton, 147 kts), $US $29 million AugustaWestland AW189 (2+19 seats, 9.1 ton, 155 kts) and the $30 million Bell 525 Relentless (biggest Bell Helicopter to-date) (2+20 seats, 9.7 ton, 155 kts), as they take over from the older AS365, AW139, Bell 412, EC155, S76. Of which 1,742 were delivered between 2000-2014, or 116 per year average, around $US 1.25 billion a year in value. As oil companies went further out from shore they needed new helicopters with the range and capacity to meet these new drilling sites. The super medium helicopters generally are for oil and gas exploration, fewer seats, 7-9 tons, while the production platforms need the super large high capacity heavy segment helicopters (+9 tons) $28 million AS332 and $25 million EC225 Super Puma against the $25 million Sikorsky S92A+/B, and lesser degree the Mi-17 and Mi-38. CHC Group (NYSE:HELI) is down around $0.30 per share, YTD (year to-date) decline of stock is 90% ! market cap around $25 million, yes bad in deed. ERA Group (NYSE: ERA) is down around $17.96 per share, YTD -15%, market cap $375 million. PHI Inc. (NASDAQ: PHII) is down around $26.59 per share, YTD -26%, market cap 449 million. Bristow Group (NYSE: BRS) is down around $36.37 per share, YTD -45%, market cap $1.36 billion. These are bad days for the industry and even though they try and put an optimistic spin on the news, they will suffer for at least the next 2 years, as oil will NOT rebound anytime soon (barring a major global war, especially in the Middle East). The helicopter operators are doing what they can to cut costs, lay-offs, fleet reductions and rationalizations and sell offs as well as deferring deliveries, bad news for now Lockheed Martin owned Sikorsky (80% of its sales are to oil/gas industry), AugustaWestland and Airbus Helicopters, expect major decrease in deliveries over the 2 years. The years of high oil prices have made them lots of money, business was booming, and as we know, nothing keeps going up and up., now some are fighting for their survival. The top 4 operators above all follow different strategies, some more into production, some more into exploration (hardest hit) and others most have in one way or another diversified into Search & Rescue (good steady government business), Emergency Medical Services (Air Ambulance) and Maintenance, Repair and Overhaul (down as well, less flying, less helicopters). 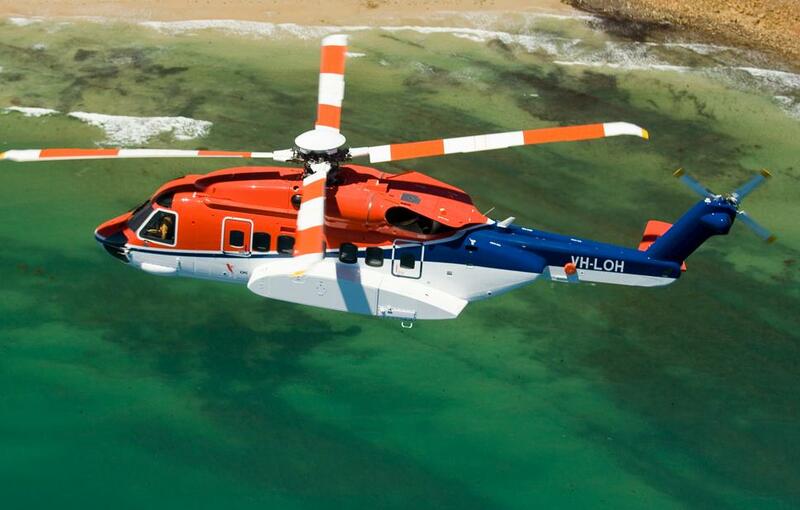 CHC Group’s Sikorsky-S92A in Australia (ABOVE photo). The Group has seen better days, once a Canadian icon, now struggling to survive, stock (NYSE:HELI) at $0.40 today, the company has till end of the year to get above $1.00 per share or be-delisted after only 2 years of trading, after an IPO at $10 a share, that has lost initial investors 96% of its IPO value. Has 233 helicopters, but market cap today is $35.5 million. The company has lost $US1.176 billion in net income since 2013, retained earnings by shareholders is $-2.07 billion ! begging the question how ? when the other 3 operators were booming. Funny stuff in the accounting, wrote off Goodwill in 2014 worth $432 million, in 2015 wrote off asset impairments at $553 million, all of which lower net income significantly, which in turn lower share price, which is now below $US 1.00 on the NYSE, and the company has till December to get it up to an average of $US1.00 for 30 days or risk being de-listed off the NYSE, and then back to private hands ? and HELI investors get zip ? Being based in the offshore haven of Cayman Islands, I cannot but wonder what the strategic goal is, 96% decline in stock since IPO 20 months ago, credit rating by Standard & Poor’s is lowered to B from B+, net loss per share $11.17, earnings per share loss of $1.82, litigation by IPO investors for failure to properly inform them of financial situation and yet the $21 billion private equity investmen firm, Clayton, Dubilier & Rice has bought 600 million of CHC Group’s convertible preferred shares for $US 600 million ($100m August 21/14, $116m Oct 30/14 and $384m Nov 12/14) when the HELI stock was in a free fall already. Yes, the private equity investors build stronger and more profitable businesses but from the outside looking in, there is something just not right, but with the conversion Clayton, Dubilier & Rice will own, control and run CHC Group, so worth watching for sure. The convertible preferred shares are not registered under the US Securities Act of 1933, and may not be offered or sold in the USA, the dividend is 8.5% per annum and accrues quarterly, the kicker is the conversion price at $7.50 per share, with holder able to convert to ordinary shares at any time and mandatory conversion if ordinary share price is at or above 175% of the conversion (so $20.62 a share), from the current $US 0.40 per share to $US 20.62 a share is 51.5 times current stock price ? I particularly want to talk about the crisis at Vancouver “based” CHC Group (which employed around 4,500 at the beginning of the year), and real ownership is in the Cayman Islands. This company’s history goes back to 1947, and became Okanagan Helicopters in 1949, in 1987 it was bought by one of Canada’s aviation icons, Craig Dobbin, who merged Okanagan Helicopters with Viking Helicopters, Toronto helicopters and his own Sealand Helicopters, and renamed it CHC Helicopter Corporation. In 2015 the company had 233 helicopters of which 116 were heavy (42 x S92, 37 x EC225, 37 x 37 x AS 332L) and 117 were medium (39 x AW139, 58 x S76, 20 x other)with 70+ bases, 30+ countries, with 83% of revenue from offshore transport, 9% of revenue from SAR (search and rescue) and EMS (air ambulance) and 9% from MRO (maintenance, repair & overhaul). The company’s helicopter fleet has a value of $US 3.1+/- billion, yet $35.5 million market cap ? The revenue breakdown by country is #1. Norway 30%, #2. U.K. 16% #3. Brazil 15% #4. Australia 14%, so 4 countries make up 75% of its revenue. In February, 2008 CHC was acquired by First Reserve, a US based private equity firm for $US 3.5 billion, and it became CHC Helicopter, and it remained a private company until January 16, 2014 when First Reserve did an IPO (initial public offering) of 31 million shares (43.3% of shares) at $10.00 on the New York Stock Exchange (NYSE). Things did not go well right off the bat, quickly the shares dropped, by mid August, 2014 NYSE:HELI was around $6.30 a share (37% drop in 7 months), by the beginning of this year, the stock was at $3.03 per share (69.7% drop in 50 weeks ! and falling to $0.29 by August 17th, 2015 while rebounding today to $0.40 a share (market cap $US 35.5 million). How could investor confidence disappear overnight ? well you have investors that paid $10.00 a share in the IPO 20 months ago and all that is left is now $0.40 ? a 96% loss ! Looking at the 2015 numbers, where their year-end is April 30, 2015, the company had revenues of $US 1.707 billion, -3.2% on 2014, so no major disaster there, yet bottom line is a net loss of $794.76 million (-46.5% net loss margin). The the company lost $170m in 2014, lost $116m in 2013 and lost $96m in 2012, so a loss of $US 1.016 billion in the last 4 years and yet $985 million was write downs, in fact retained earnings show a negative $2.070 billion and a negative total shareholder equity of $ -425 million and $2.070 billion in liabilities, indicating that this company was rarely profitable, but cashflow was good as it got by and write downs of Goodwill and Asset Impairment ($US 985m combined in 2 years) don’t show up elsewhere in their ledgers, so deliberate policy to keep profit negative ? why when market is softening and stock is in a downward spiral. Further investigation showed a $US 553.65 million asset impairment, yet no explanation/footnote anywhere ? now asset impairment are assets that are said to be impaired when their carrying value (acquisition cost – accumulated depreciation) is greater than the future un-discounted cash flow that these assets can provide and be disposed of, it occurs when there is a decline in usage, technology, changes in regulations or significant decline in the long term profitability of the asset. So the stock becomes a “penny” stock on June 30, 2015 when it dropped to $0.89 and the company uses accounting to lower net income ($US 432m for Goodwill in 2014 and $553m in asset impairment in 2015), so $US 985m in 2 years, why ? the NYSE is not impressed, and on July 23, 2015 the New York Stock Exchange notifies CHC, that its HELI stock is not in compliance with listing standards that require a minimum closing price of $1.00 per share over a period of 30 consecutive trading days, so the company has 6 months (end of year) to get the stock up above $1.00 or be de-listed on the NYSE, roughly 2 years after it listed ? So what Clayton, Dubilier & Rice sees in the company, is not clear to me or market. It is all very odd to me as to what is up with the CHC Group, and then there is investor class action litigation against CHC Group, as it has come out that CHC was not being paid by one of its main customers, Petrobas (Brazil) 10 months before the IPO, and nothing was said about it by CHC. It is a mess, will CHC Group survive the next 3 years ? at least some equity investment firm thinks so, hope they are right. All big names, so why would CHC Group give itself such unwanted attention, litigation, huge loss that led to penny stock status ? Stay tuned there is more to this story for sure. The offshore helicopter business is going through a tough period, and some may not survive, the irony is that the rest of aviation is booming, and the guys that help bring that oil to market are the one’s hurting now, nothing is ever perfect, where there are winners, someone has to loose. « UPDATE: Bombardier stock (TSX:BBD.B) hit a low of $1.19 on Wednesday (today it “rallied” and closed at $1.29) as it continues its spiral towards becoming a penny stock, if it was listed on the NYSE (New York Stock Exchange), it would mean possible de-listing of the stock, as Vancouver’s CHC Group (global helicopter company) is now facing for its NYSE:HELI stock that is now hovering at around $0.30 a share (-90% YTD). After my many warnings about the many questionable and poor quality of airline orders for its CSeries, investors and aviation experts are now finally starting to take notice that after 7 years of sales the current minuscule 243 CS100/300 ‘firm’ orders are in fact a whole lot smaller, with many questionable airline orders possibly as low as 130 ‘real’ orders (53% of what is on the books today). Bombardier desperately needs a NEW CS100/300 brand name airline order in the next 30-45 days to prevent the slide of its stock below $C 1.00, as that is the only way in the short term it can gain some investor confidence to stop the stock’s downward spiral. The CS100 is going to be certified in the next 3-5 months, but by then the stock will be a penny stock if no quality new order or some new un-predicted good news is forthcoming soon from Bombardier. The planned IPO of Transportation division in 4th Quarter will raise up to $US 2.5 billion for a 49% sale, but it will most likely impact BBD.B stock negatively, as the trains are 50% of Bombardier’s business, these are desperate times at Bombardier and most Canadians want to see a bright future for this promising company. With 54% of the special voting shares in the hands of the Beaudoin family, new investors are reluctant to be subordinated and a possible hostile takeover is not yet possible. But with the company at a historic crossroad, the possibility of “Combardier” (China’s Comac buying Bombardier), is a real possibility in the next 18-24 months, as this is the only major aircraft OEM the Chinese can possibly buy today, to help them achieve their global aerospace ambitions of being #3 behind Airbus and Boeing, and they are surely watching events in Montreal with great interest. Why is this very influenticial Private Equity group, ran by former high profile people investing in CHC Group? What do they see?